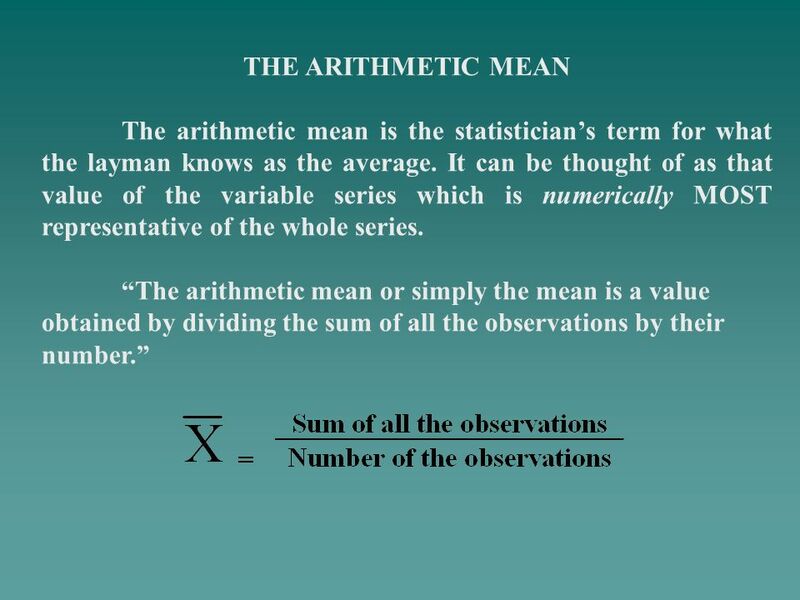 THE ARITHMETIC MEAN The arithmetic mean is the statistician’s term for what the layman knows as the average. 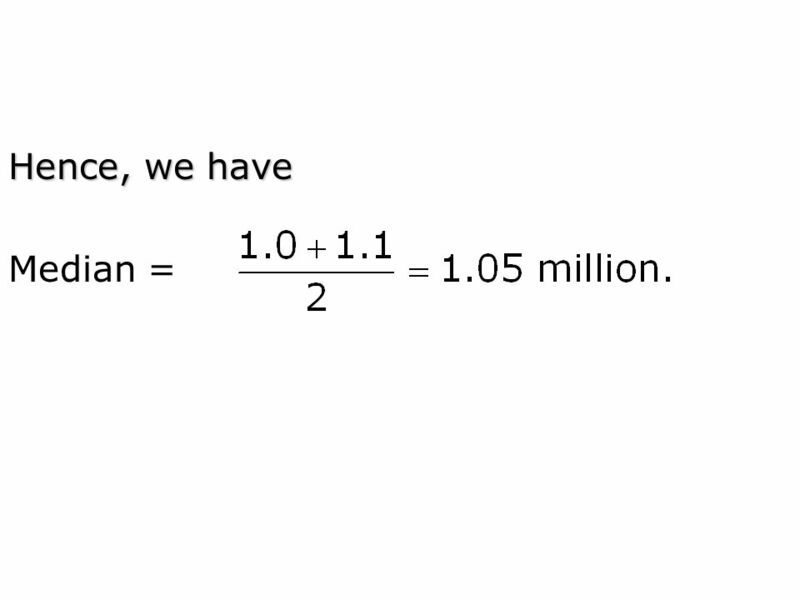 It can be thought of as that value of the. 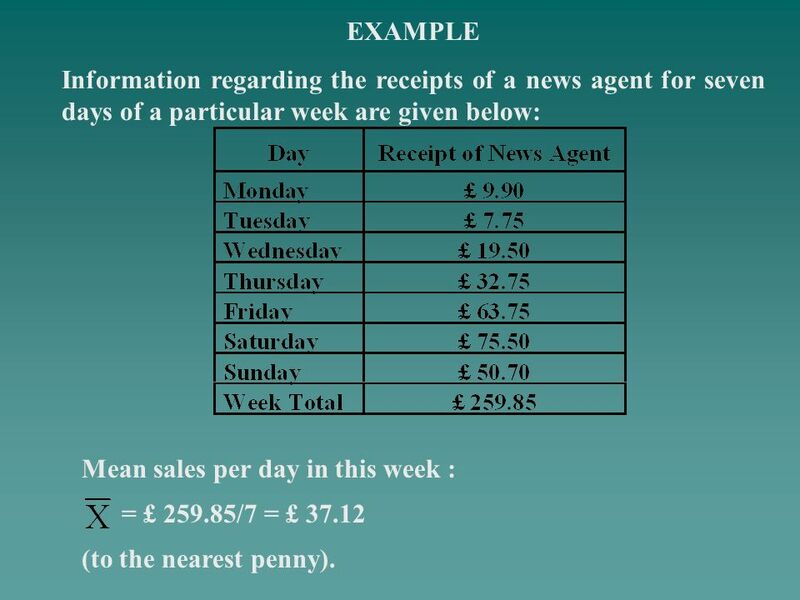 3 EXAMPLE Information regarding the receipts of a news agent for seven days of a particular week are given below: Mean sales per day in this week : = £ /7 = £ 37.12 (to the nearest penny). 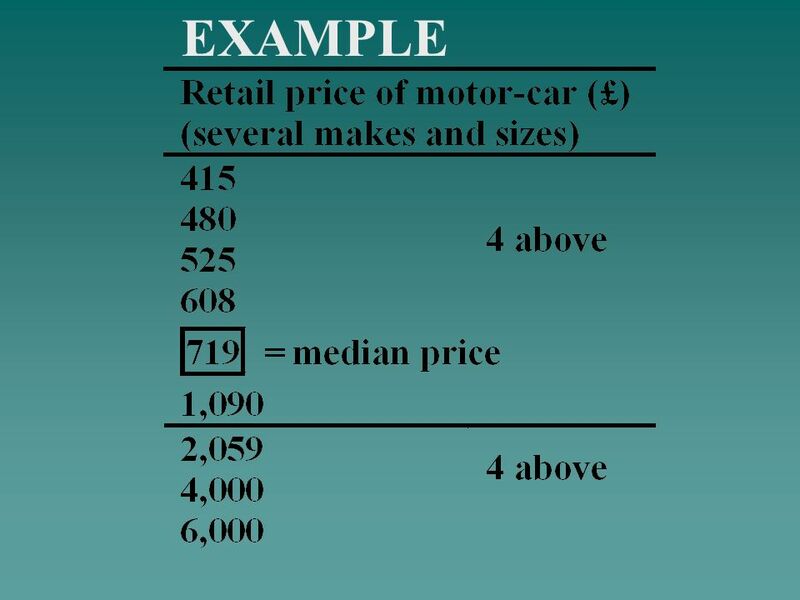 4 Interpretation: The mean, £ 37.12, represents the amount (in pounds sterling) that would have been obtained on each day if the same amount were to be obtained on each day. 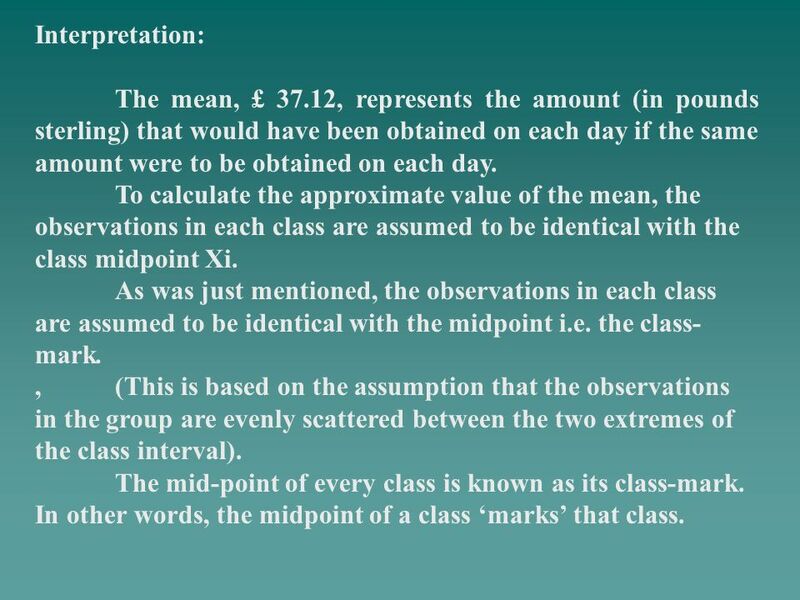 To calculate the approximate value of the mean, the observations in each class are assumed to be identical with the class midpoint Xi. As was just mentioned, the observations in each class are assumed to be identical with the midpoint i.e. the class-mark. ,	(This is based on the assumption that the observations in the group are evenly scattered between the two extremes of the class interval). 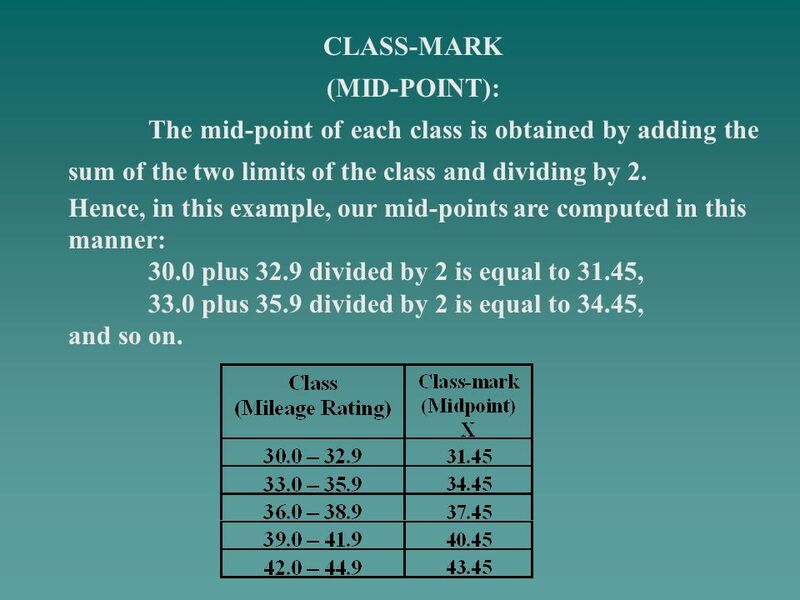 The mid-point of every class is known as its class-mark. 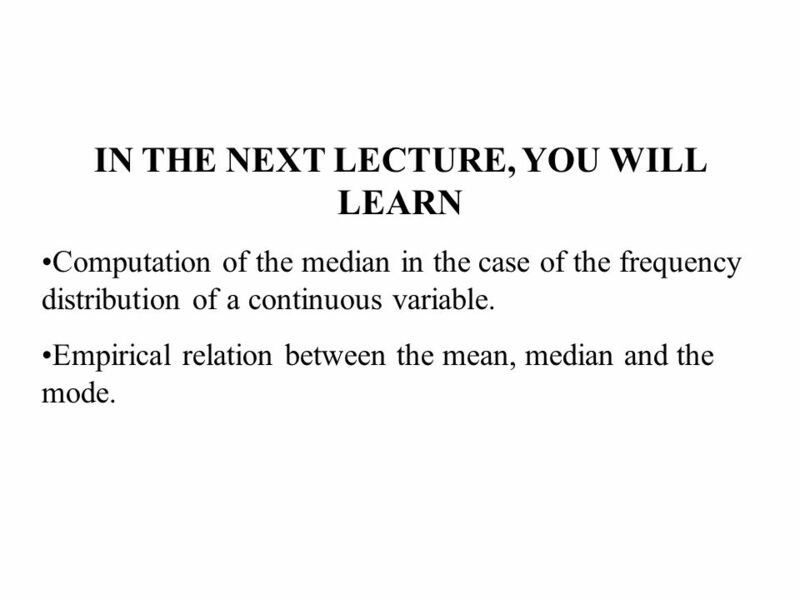 In other words, the midpoint of a class ‘marks’ that class. 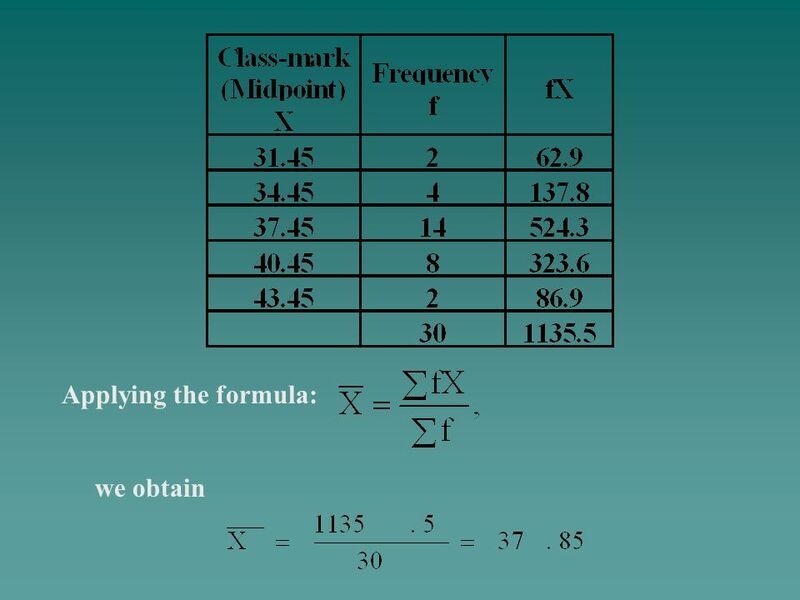 The mid-point of each class is obtained by adding the sum of the two limits of the class and dividing by 2. Hence, in this example, our mid-points are computed in this manner: 30.0 plus 32.9 divided by 2 is equal to 31.45, 33.0 plus 35.9 divided by 2 is equal to 34.45, and so on. 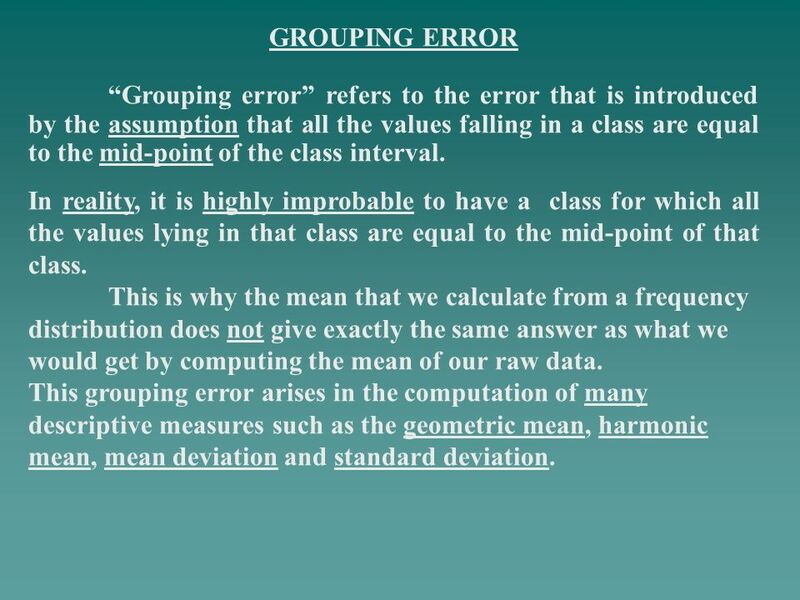 9 GROUPING ERROR “Grouping error” refers to the error that is introduced by the assumption that all the values falling in a class are equal to the mid-point of the class interval. 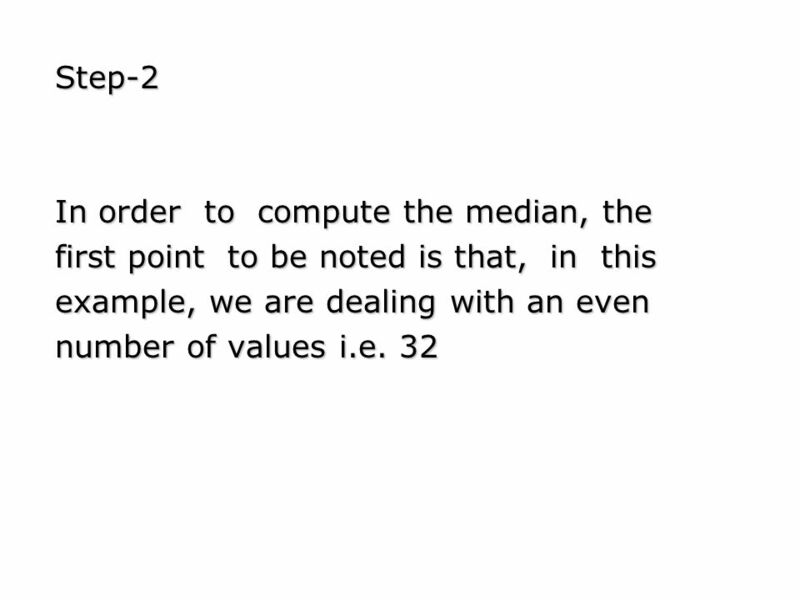 In reality, it is highly improbable to have a class for which all the values lying in that class are equal to the mid-point of that class. 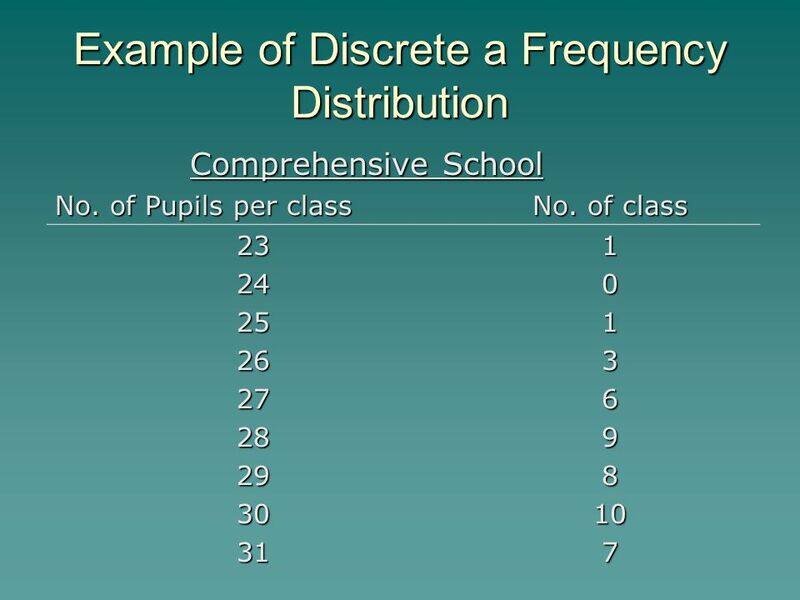 This is why the mean that we calculate from a frequency distribution does not give exactly the same answer as what we would get by computing the mean of our raw data. 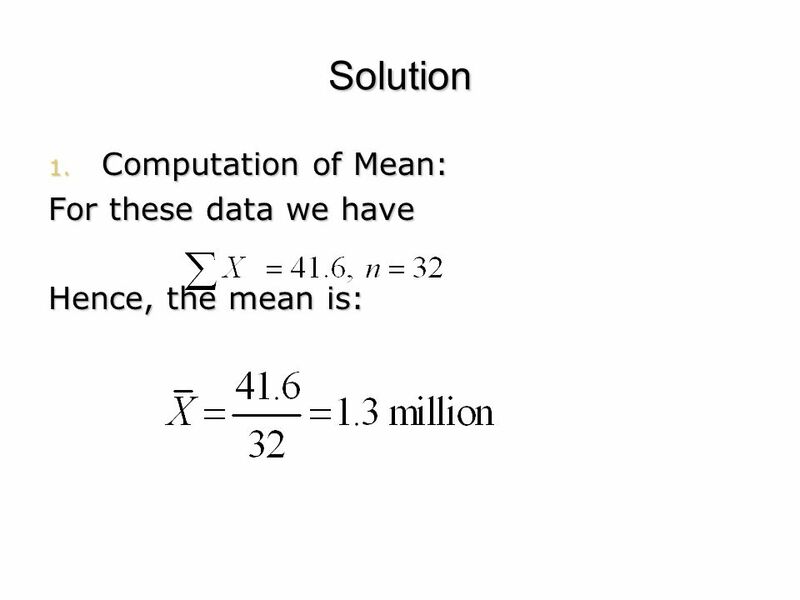 This grouping error arises in the computation of many descriptive measures such as the geometric mean, harmonic mean, mean deviation and standard deviation. 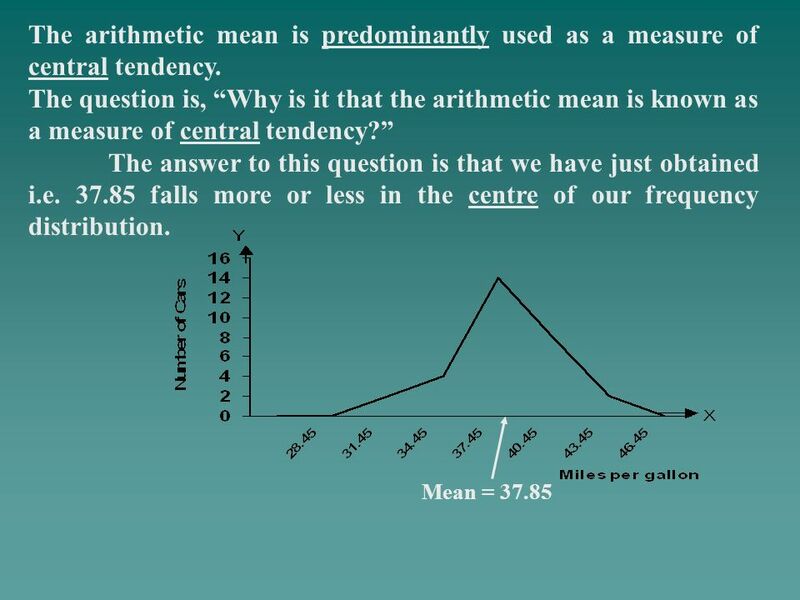 11 The arithmetic mean is predominantly used as a measure of central tendency. Suppose one walks down the main street of a large city centre and counts the number of floors in each building. 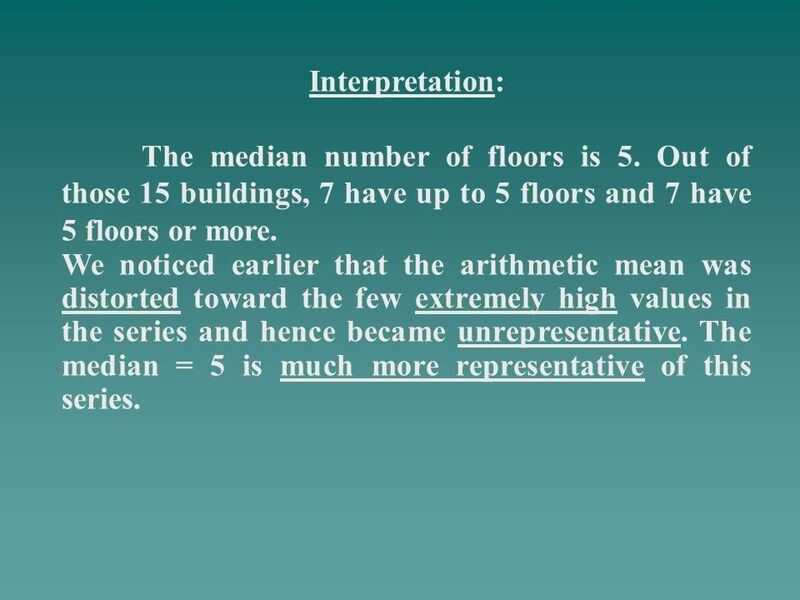 Suppose, the following answers are obtained: 5, 4, 3, 4, 5, 4, 3, 4, 5, 20, 5, 6, 32, 8, 27 The mean number of floors is 9 even though 12 out of 15 of the buildings have 6 floors or less. 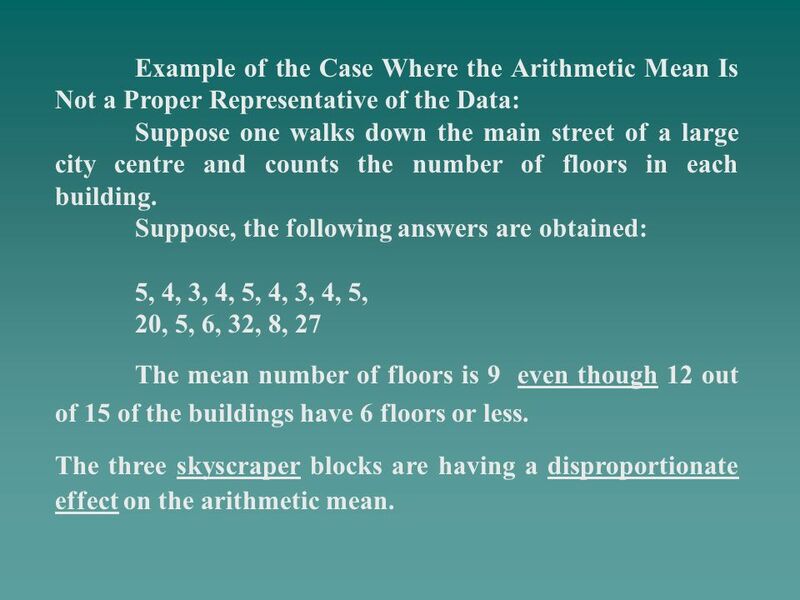 The three skyscraper blocks are having a disproportionate effect on the arithmetic mean. 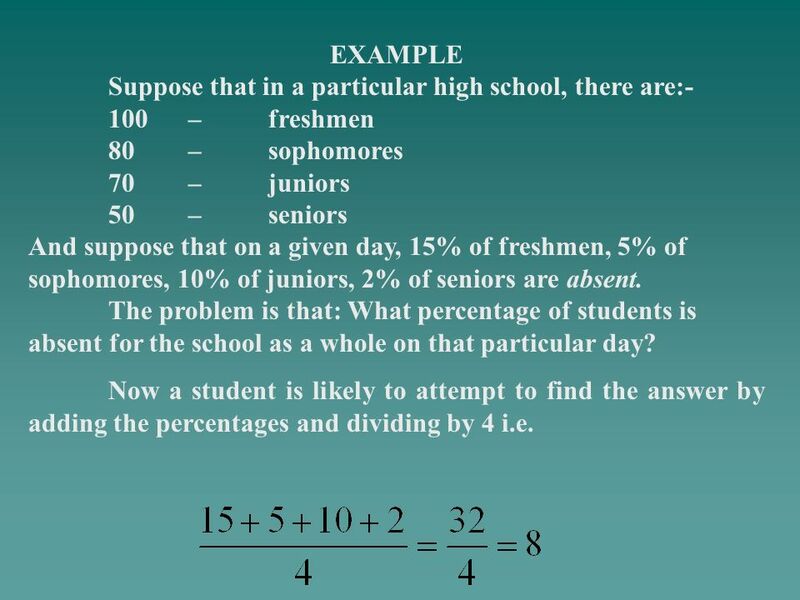 14 EXAMPLE Suppose that in a particular high school, there are:- 100	–	freshmen 80	–	sophomores 70	–	juniors 50	–	seniors And suppose that on a given day, 15% of freshmen, 5% of sophomores, 10% of juniors, 2% of seniors are absent. 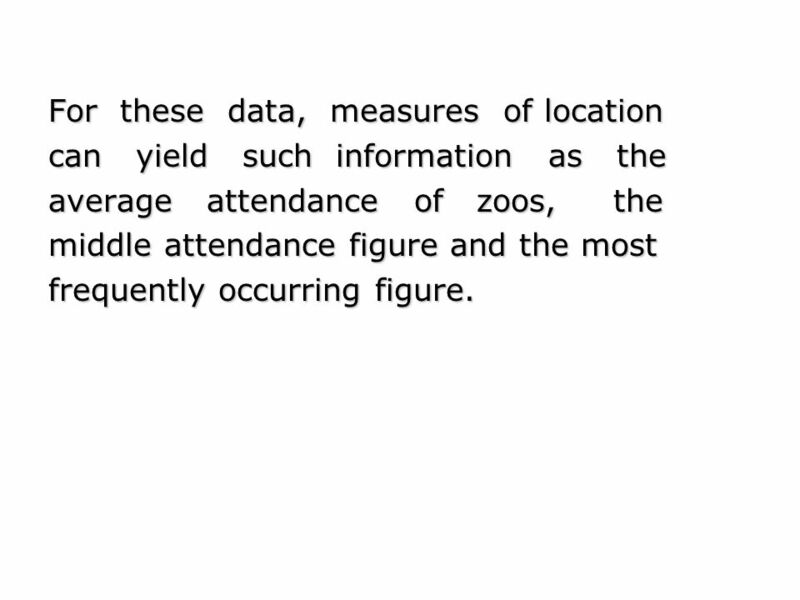 The problem is that: What percentage of students is absent for the school as a whole on that particular day? 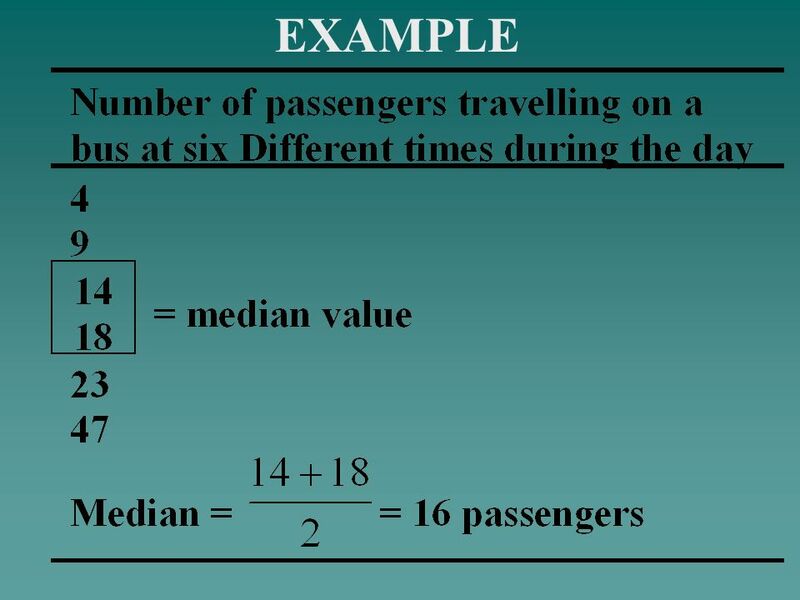 Now a student is likely to attempt to find the answer by adding the percentages and dividing by 4 i.e. 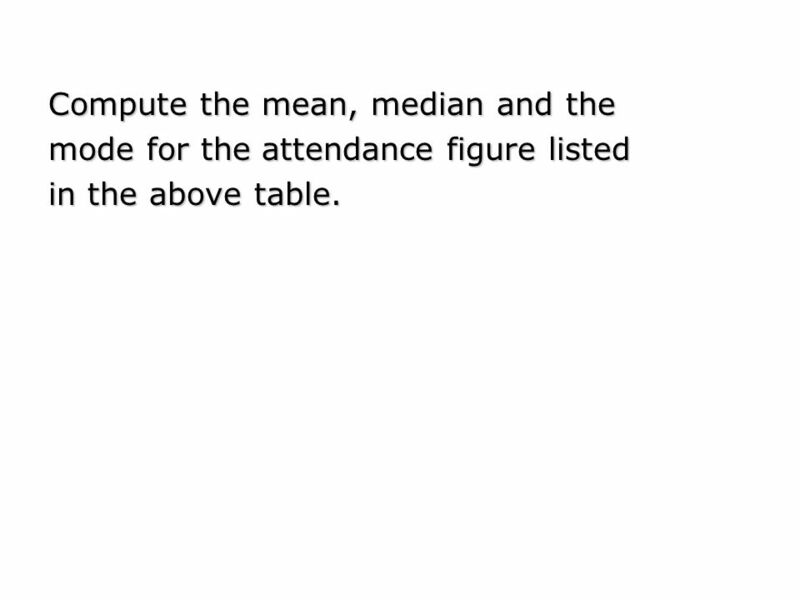 15 As we have already noted, 15% of the freshmen are absent on this particular day. 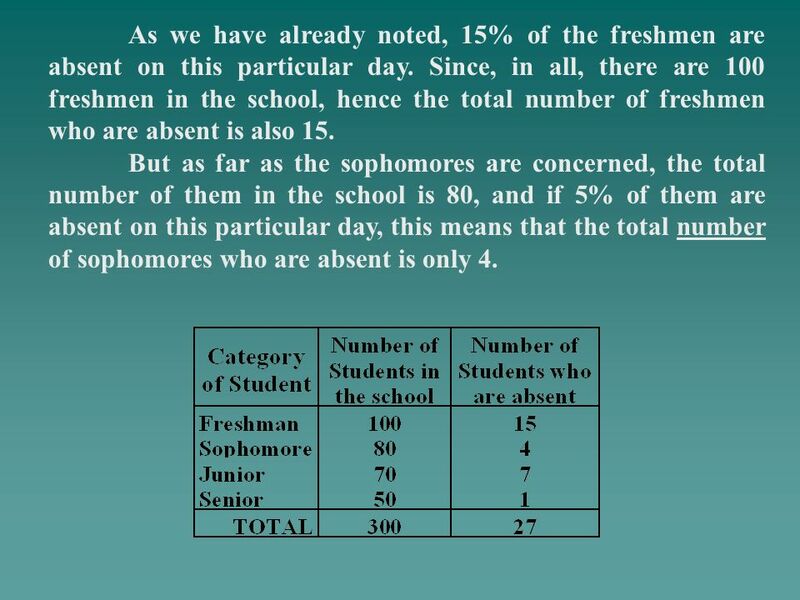 Since, in all, there are 100 freshmen in the school, hence the total number of freshmen who are absent is also 15. 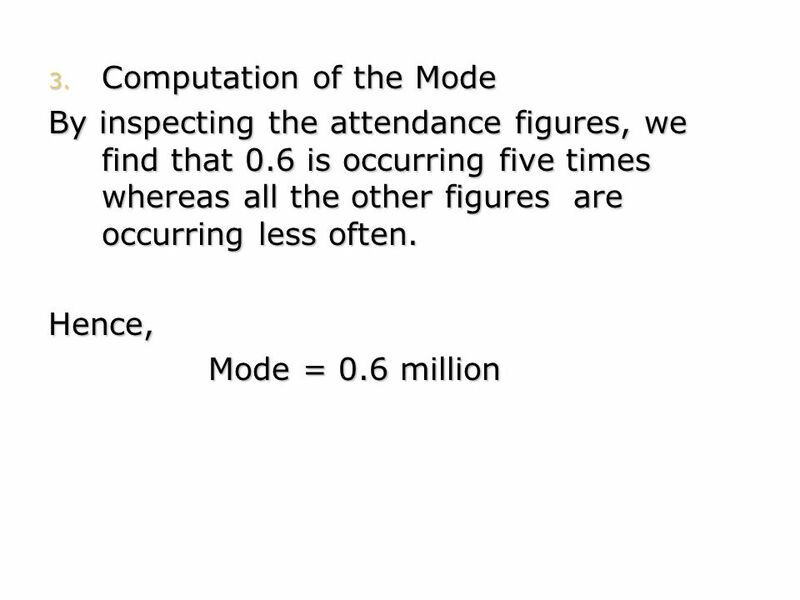 But as far as the sophomores are concerned, the total number of them in the school is 80, and if 5% of them are absent on this particular day, this means that the total number of sophomores who are absent is only 4. 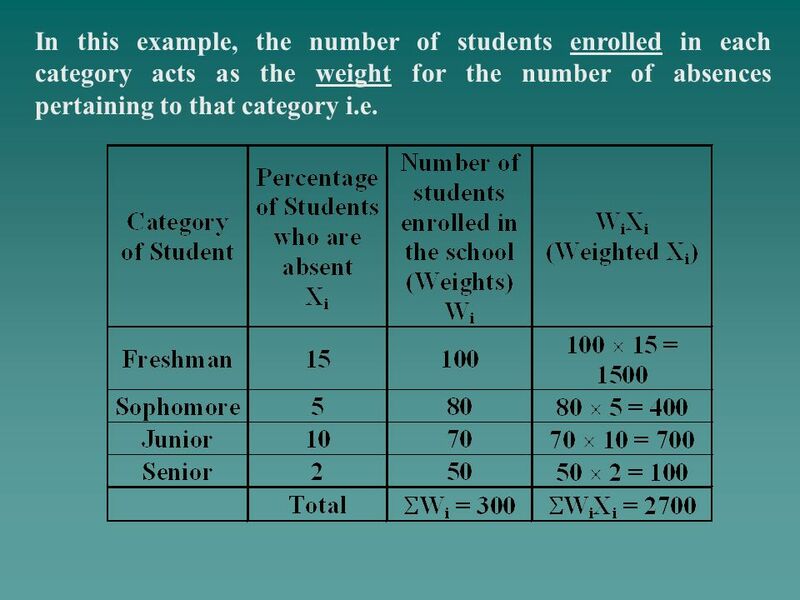 17 In this example, the number of students enrolled in each category acts as the weight for the number of absences pertaining to that category i.e. 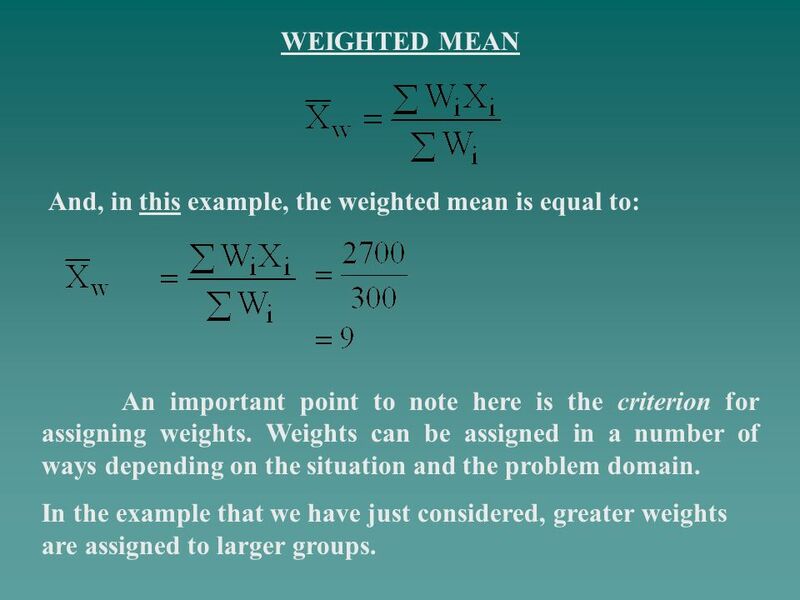 18 WEIGHTED MEAN And, in this example, the weighted mean is equal to: An important point to note here is the criterion for assigning weights. 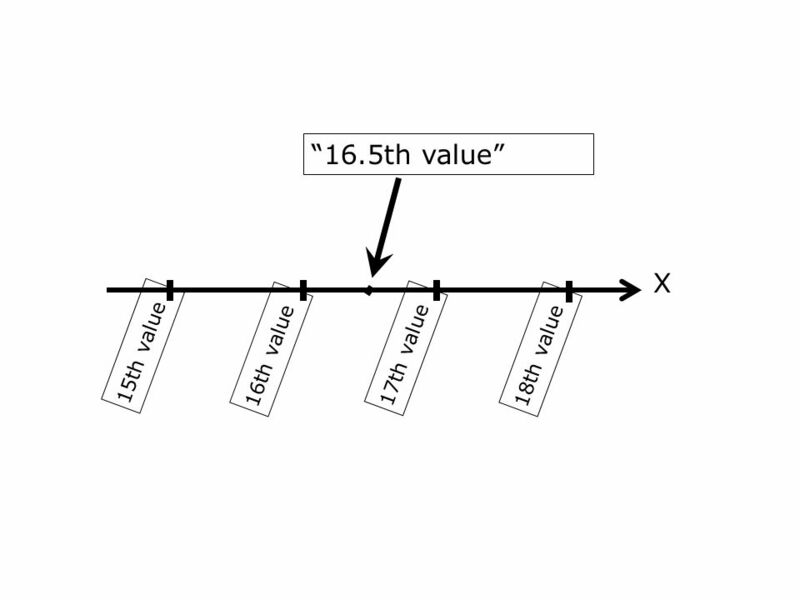 Weights can be assigned in a number of ways depending on the situation and the problem domain. 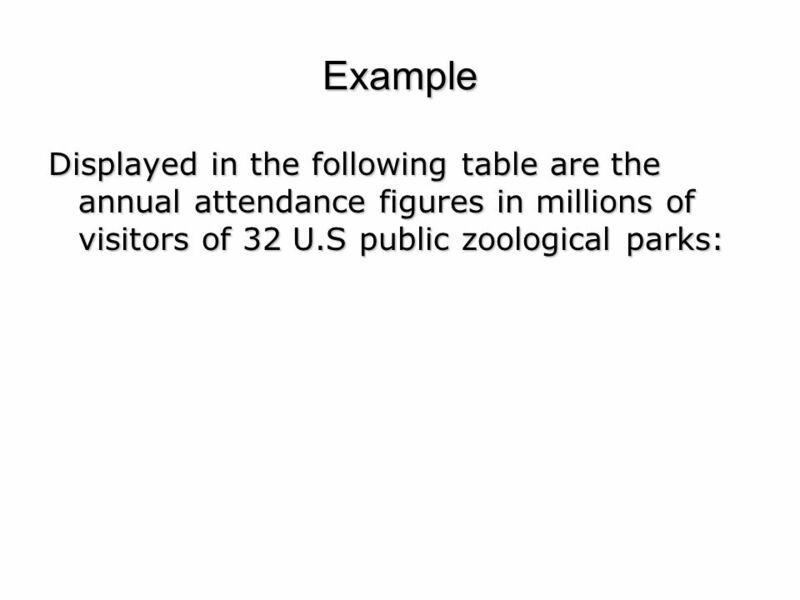 In the example that we have just considered, greater weights are assigned to larger groups. 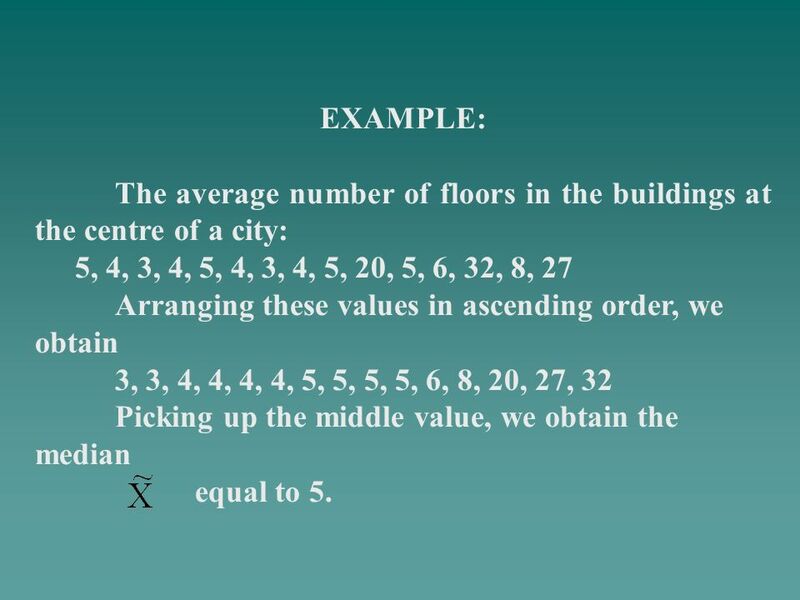 20 EXAMPLE: The average number of floors in the buildings at the centre of a city: 5, 4, 3, 4, 5, 4, 3, 4, 5, 20, 5, 6, 32, 8, 27 Arranging these values in ascending order, we obtain 3, 3, 4, 4, 4, 4, 5, 5, 5, 5, 6, 8, 20, 27, 32 Picking up the middle value, we obtain the median equal to 5. 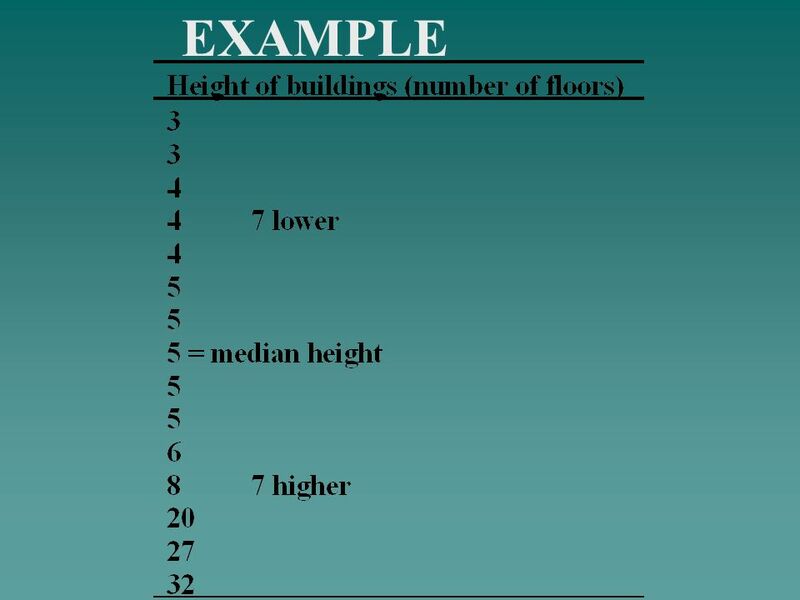 21 Interpretation: The median number of floors is 5. Out of those 15 buildings, 7 have up to 5 floors and 7 have 5 floors or more. 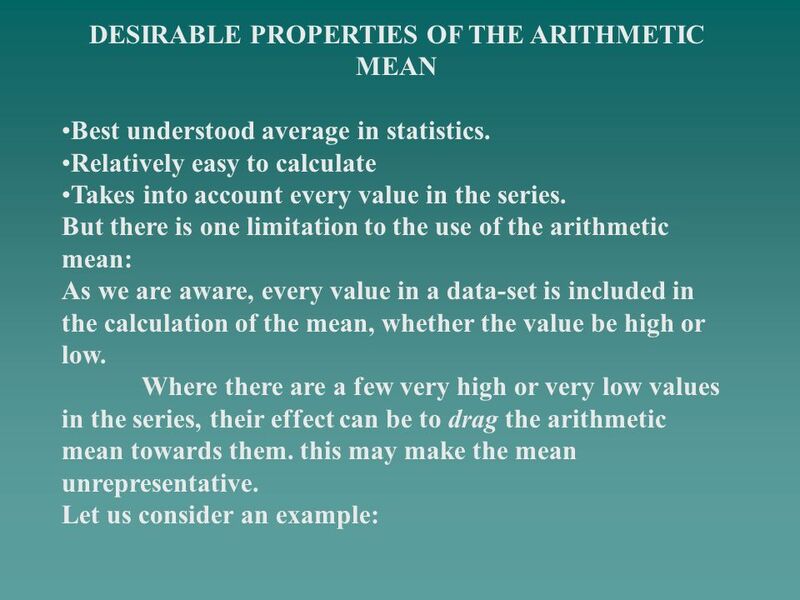 We noticed earlier that the arithmetic mean was distorted toward the few extremely high values in the series and hence became unrepresentative. 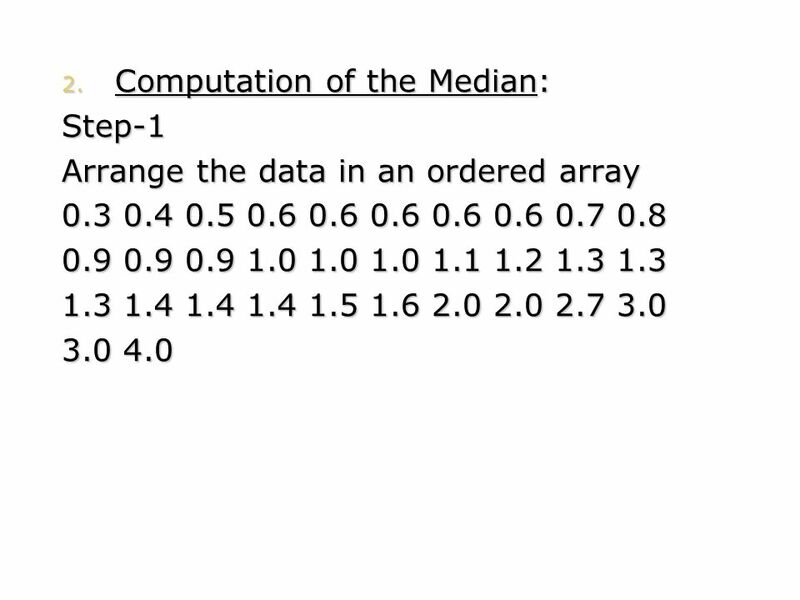 The median = 5 is much more representative of this series. 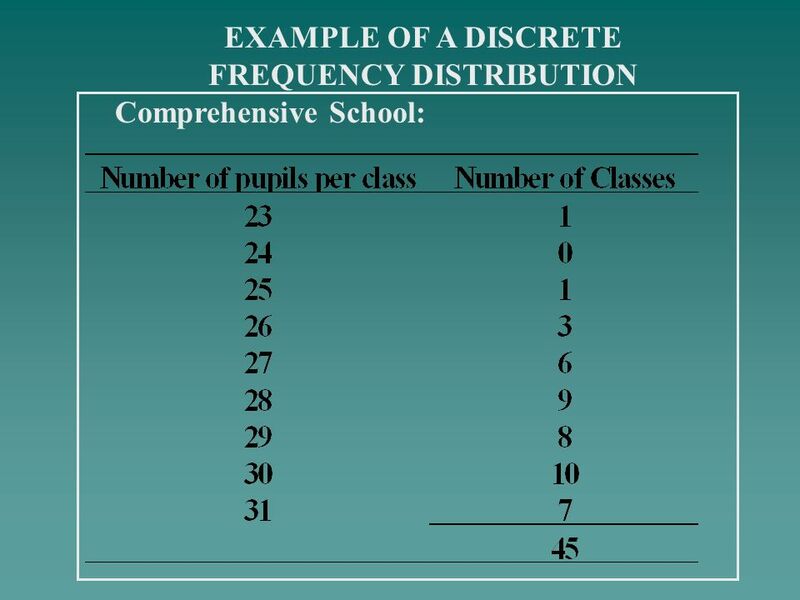 27 In this school, there are 45 classes in all, so that we require as the median that class-size below which there are 22 classes and above which also there are 22 classes. 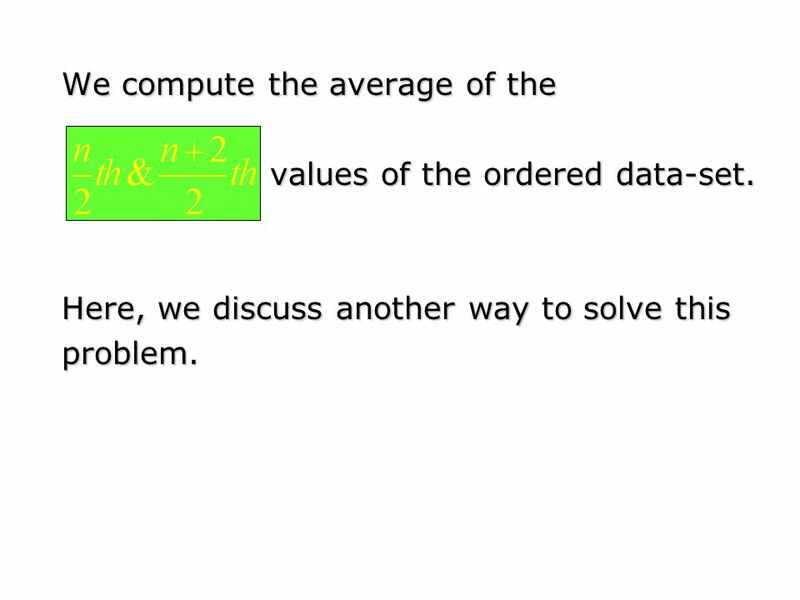 In other words, we must find the 23rd class in an ordered list. 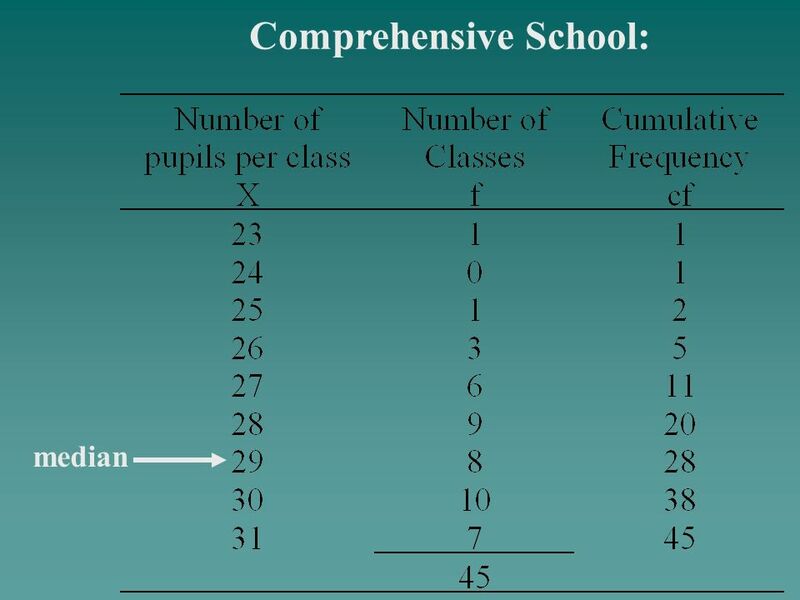 We could simply count down noticing that there is 1 class of 23 children, 2 classes with up to 25 children, 5 classes with up to 26 children. Proceeding in this manner, we find that 20 classes contain up to 28 children whereas 28 classes contain up to 29 children. This means that the 23rd class --- the one that we are looking for --- is the one which contains exactly 29 children. 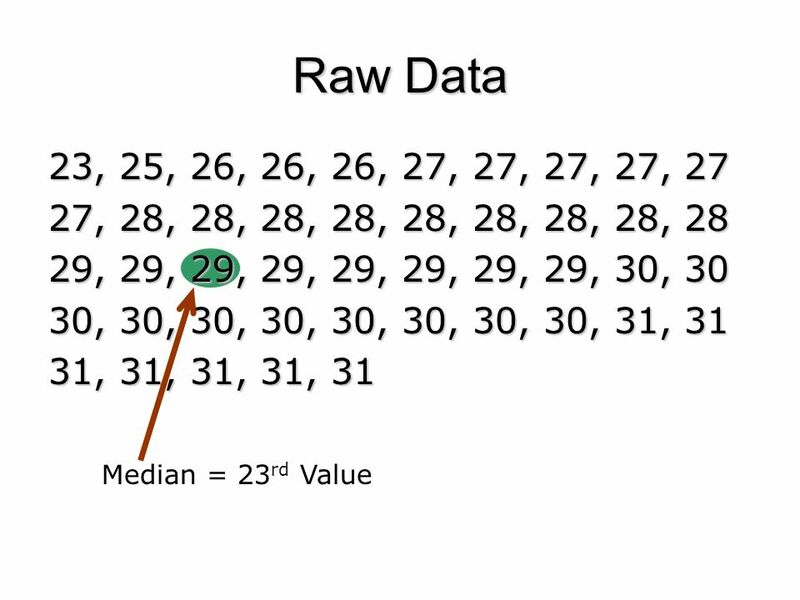 This means that 29 is the middle size of the class. 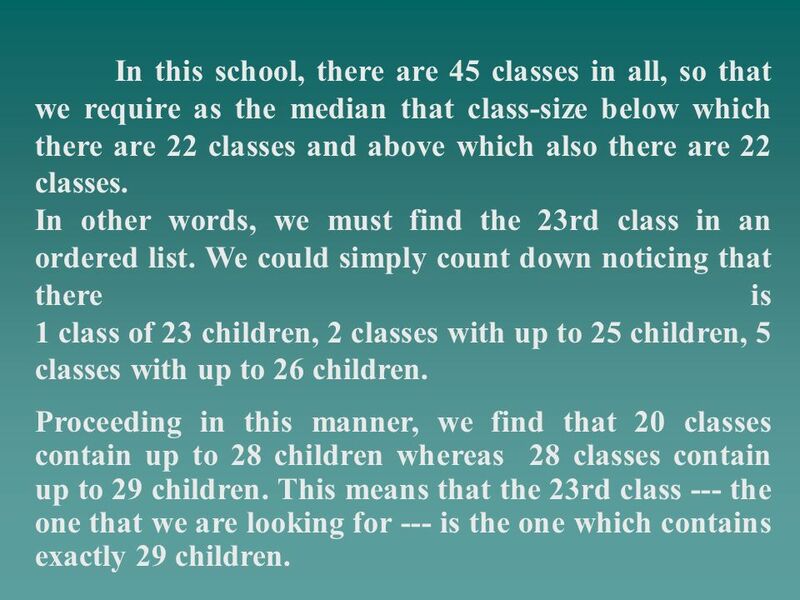 In other words, 22 classes are such which contain 29 or less than 29 children, and 22 classes are such which contain 29 or more than 29 children. 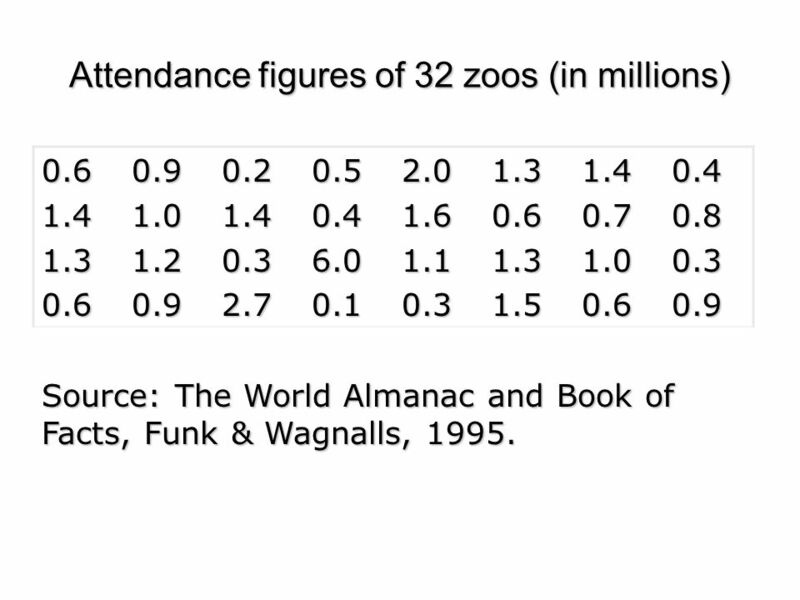 0.6 1.4 1.3 0.9 1.0 1.2 0.2 0.3 2.7 0.5 0.4 6.0 0.1 2.0 1.6 1.1 1.5 0.7 0.8 Source: The World Almanac and Book of Facts, Funk & Wagnalls, 1995.
can yield such information as the average attendance of zoos, the middle attendance figure and the most frequently occurring figure. 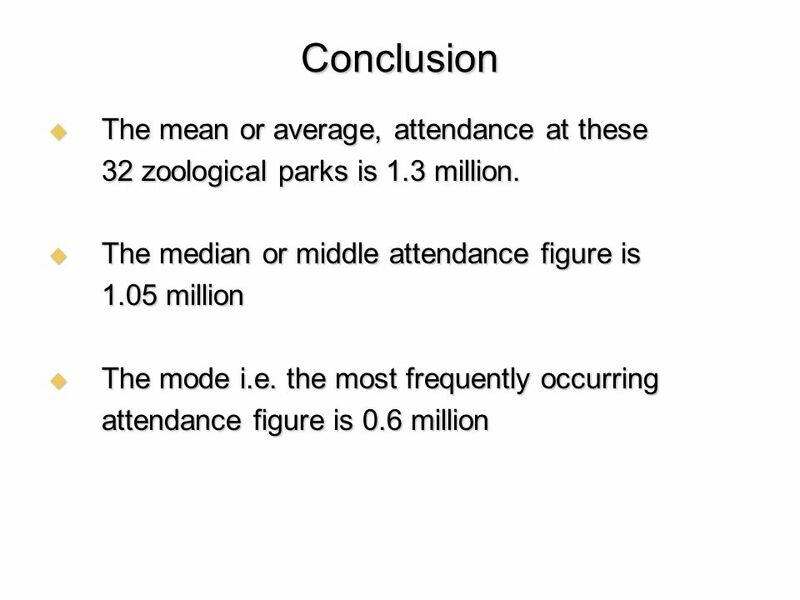 mode for the attendance figure listed in the above table. 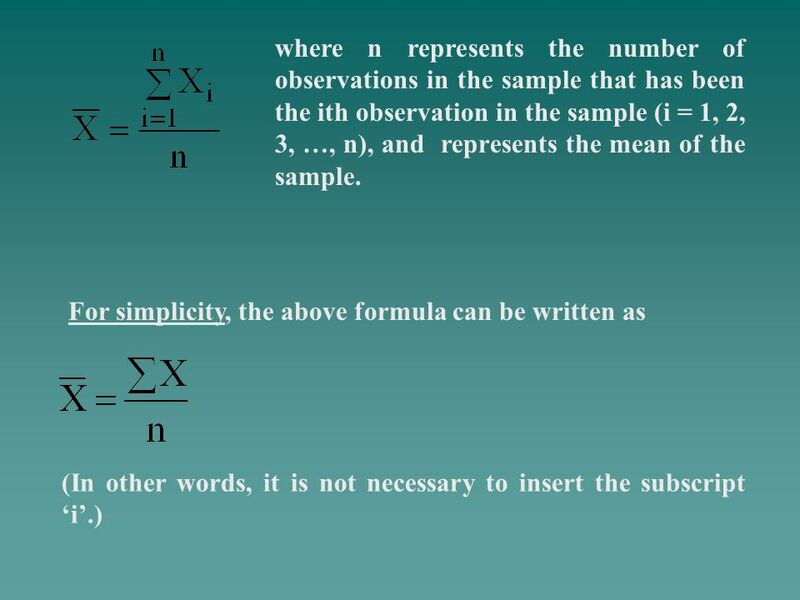 values of the ordered data-set. Here, we discuss another way to solve this problem. 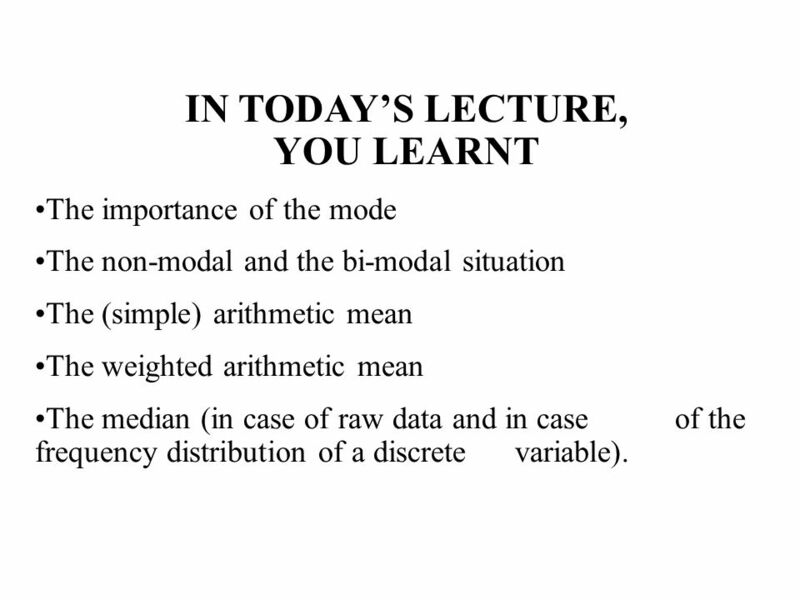 The importance of the mode The non-modal and the bi-modal situation The (simple) arithmetic mean The weighted arithmetic mean The median (in case of raw data and in case of the frequency distribution of a discrete variable). 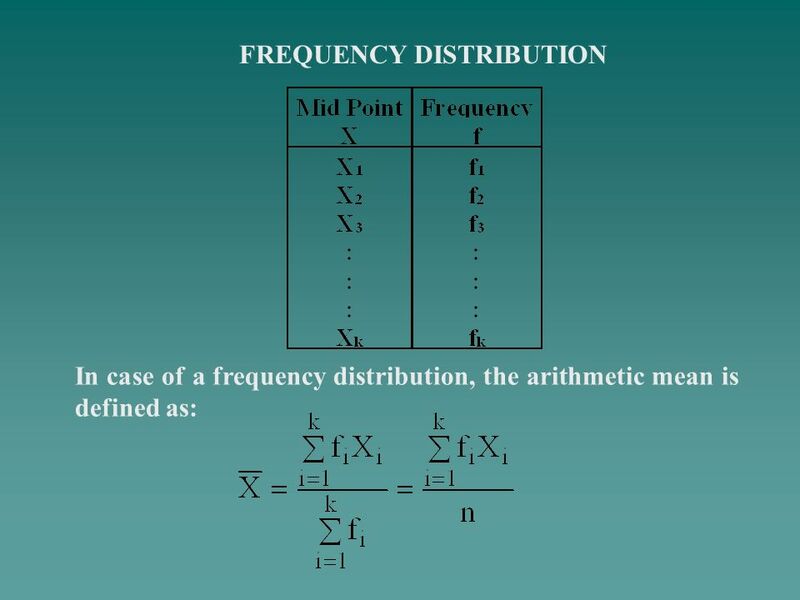 Computation of the median in the case of the frequency distribution of a continuous variable. 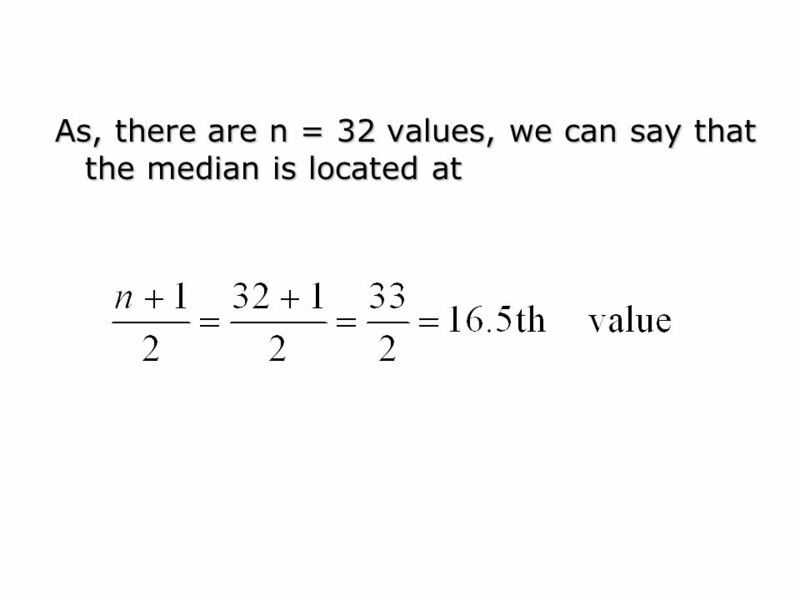 Empirical relation between the mean, median and the mode. 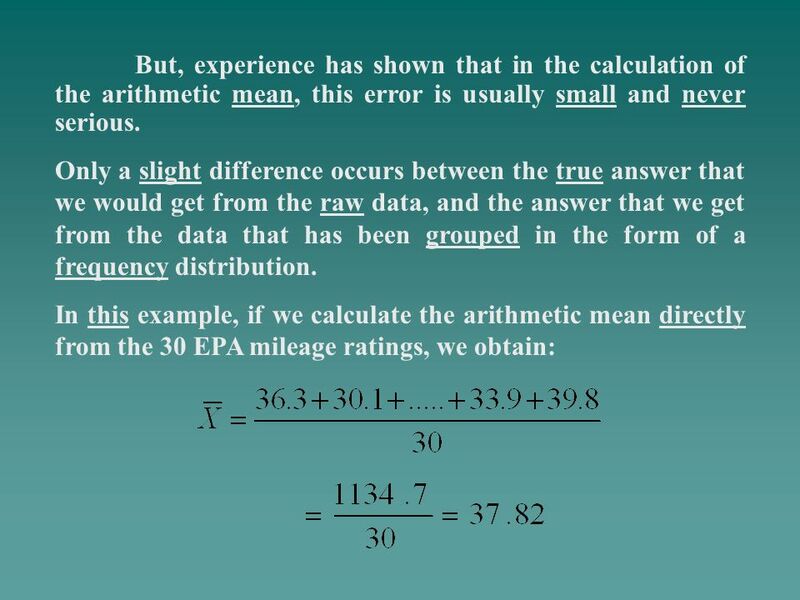 Download ppt "THE ARITHMETIC MEAN The arithmetic mean is the statistician’s term for what the layman knows as the average. It can be thought of as that value of the." 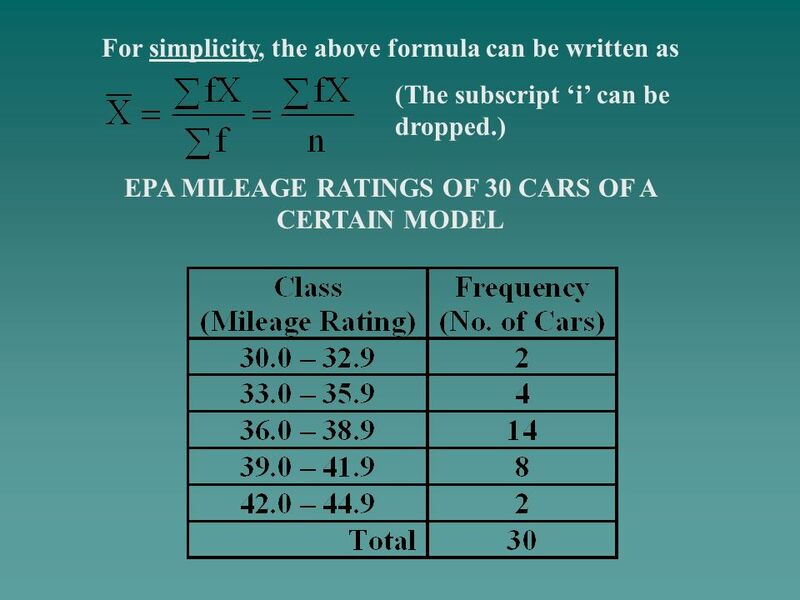 October 31, 2005Copyright © by Erik D. Demaine and Charles E. LeisersonL13.1 Introduction to Algorithms LECTURE 11 Amortized Analysis Dynamic tables. 1 1 Slide © 2003 South-Western/Thomson Learning TM Slides Prepared by JOHN S. LOUCKS St. Edwards University. 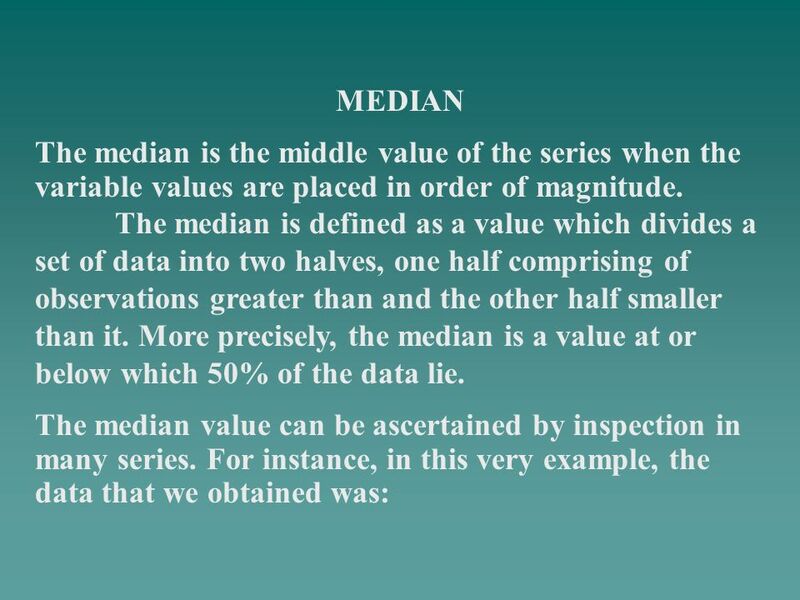 © The McGraw-Hill Companies, Inc., 2000 10-1 Chapter 10 Testing the Difference between Means and Variances.